As Tarot readers, one thing that we want more than ever is to be able to connect with our intuition and to access the inner wisdom that is available to us, with Tarot as a guide. But, many of us struggle to make that intuitive connection consistently. We second-guess our intuitive insights and we don’t fully trust what our hearts have to tell us. Well, what if I was to tell you that there is a very simple way to connect with your intuition and sink in to your heart space as a Tarot reader? In this podcast, I welcome Maia Toll – herbalist, ritualist and leader of Witch Camp, an earth-based program designed to reconnect people to their spiritual path through honoring natural cycles and rituals. Maia Toll shares her very best insights on how to integrate ritual into your Tarot practice to create an instant connection to the Divine. How to use ritual in your Tarot practice… without needing to recite the Book of Shadows for every reading! Brigit: You’re listening to the Biddy Tarot Podcast, and this is Episode 35: Creating Rituals with The Tarot. But, many of us struggle to make that intuitive connection consistently. We second-guess our intuitive insights, and we don’t fully trust what our hearts have to tell us. Well, what if I was to tell you that there is a very simple way to connect with your intuition and to sink in to your heart space as a Tarot reader? Today, I welcome herbalist, ritualist and leader of Witch Camp, an earth-based program designed to reconnect people to their spiritual path through honoring natural cycles and rituals. 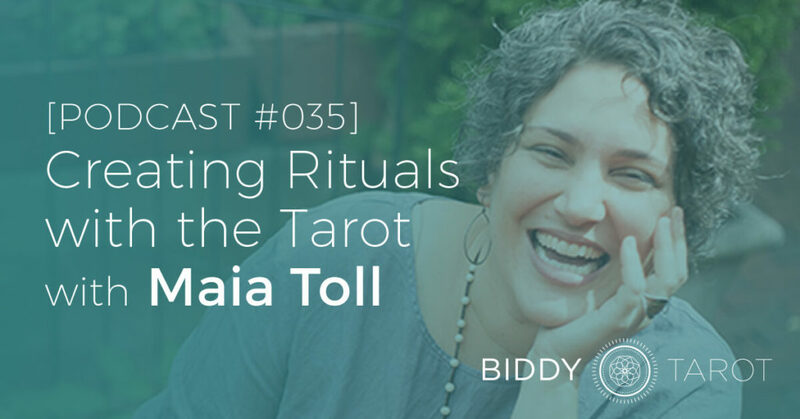 This amazing woman is Maia Toll and today she shares her very best insights on how to integrate ritual into your Tarot practice to create an instant connection to the Divine. Brigit: Welcome Maia, it is so lovely to have you here. Maia Toll: It is so great to be here. I always love talking to you, Brigit. Let’s just get straight into it. I want to hear about how you found Tarot or, as some people say, how Tarot found you. Maia Toll: You know I was thinking about this because you sent me some questions to think about earlier – and so I’ve been thinking: Wow, I remember in my 30s, when I started learning about Tarot a little more seriously. And I was digging back before then trying to remember if I used cards earlier than that, and I don’t think that I did. I’m the daughter of a Lawyer and a Family Therapist, so I had a really kind of rational upbringing……which didn’t necessarily suit my personality, but I had to get to a point where I knew myself well enough that I was willing to step beyond the things that I had been told were real and okay, and step into some of the things that interested me but felt maybe a little out there –a little esoteric. So I was a late bloomer coming to Tarot. I think at 30 or 31, I had an Acupuncturist who taught a Tarot class. And she asked me if I wanted to come. So that was my introduction – was actually like a formal class. There were eight of us who sat around her kitchen Tarot and learned the cards. Brigit: I really like that idea of Tarot helping you go from being told what to think and believe, to having that sort of knowledge or connection to your inner guidance system, which then helps you make decisions based on the inner guidance system. And, being a Tarot reader, I can’t help but think that transition, say from the Hierophant, where it is sort of the indoctrinated values and belief systems, to the Lovers where you are presented with choice and the more that you can align with your Higher Self then the better choices that you make. So I think that’s a really interesting actual, real life story of how that may have played out in your life. And I think, for me, it wasn’t only using the cards that helped with that. It was thinking about what the cards meant to me – like did I believe I was telling the future with these cards? Did I believe I was tapping into pre-destiny, and learning what it was; or somehow like parting the veils? And what I really came to, the more I interacted with these archetypical images, was that, for me, the cards – the cards are a window into my own sub-conscious, and into the collective unconscious; which is brilliant when you’re having a problem. Because you get really stuck in your own way of thinking about it – you kind of go around and around certain thought processes. And then you pull a card, or put out a spread, and you have to think about it differently. Whatever cards appear for you redirect your energy, and redirect your thinking. And, without fail, there’s always a window or a door into something that I wouldn’t have gotten to otherwise. And I think what’s really lovely about that too, is it’s not sort of this dependence on the Tarot to tell you what to do, or tell you what’s going to happen; it’s more sort of playing with the Tarot and integrating that into more of an intuitive space, perhaps. Maia Toll: Yeah – absolutely. And I think, beyond that, using it to broaden my own perceptions of what’s going on in my world. And that’s so useful, because we all get narrow. And sometimes I think the deeper in that we are, the narrower we get. It’s like when you dig a really deep hole, you’re just down in the dark in the bottom. So you really need something that can widen your vision and show you something else besides the dirt in front of your face. So these days, what role does Tarot play in your life, or how would you sort of integrate it into your life? Maia Toll: I have an Oracle that, at this point, I really love. I don’t think I’ve pulled out an actual Tarot deck in a couple of years. At some point I went from – I’m just trying to think what the right words are for this – I went from the archetypes on the cards speaking to me – and the traditional Tarot deck has such strong archetypes – so I was really identifying almost in a Jungian way with those archetypes – somewhere along the line I slipped and got way more into the imagery. And so I really love the modern Oracle decks for that, because some of them are just stunning. And I feel like I can look at the card, and get a sense of it – read from the picture instead of having something memorised or kind of intellectually going into the archetype. So it was almost like I did a flip from the intellect to intuition, and started working more with the Oracle cards because I was able to get pictures that were really speaking to me. That said, I have one deck in my office, one deck in the main house – I use them a lot. I might flip a card just when I walk into my office in the morning. Just kind of to help me set an intention for the day. I often will ask: What am I not seeing? That’s a favourite question of mine. Just to kind of, again, open things up – widen things out: What am I not seeing? What’s on the periphery that I need to pay attention to? So I use them in a really daily way – like without pre-thought or without a whole lot of ceremony. I don’t lay out an altar cloth or light sage or anything like that. I just grab a card – take a minute – centre and still and grab a card. And then on the other hand, I’ll also use them much more intentionally when I’m doing little personal rituals. And actually you’ll like this Brigit, my business mastermind group – I have a little group called the Sisterhood of the Travelling Pyjamas – and when we get together, at the end of everyone’s session where we discuss what’s going on with their business, and what they might want to change or move toward in the future, the last thing we always do is pull a card. So, we have created a ceremony around this process where we sage first – using the sage just to let go of anything that doesn’t serve – and then the last thing we do after we all talk for an hour, is pull a card. And that’s kind of like it’s the final say. The cards have the final say. Brigit: Nice – what a beautiful way to sort of close an intensive process like that. So, Maia, you are, I think, one of the queens of rituals, so I’m really curious: What role does ritual play in your life? And how do you sort of engage with ritual on a more every-day basis? Maia Toll: One thing that I’ve definitely come to for myself is, I don’t like anything prescribed. And if you take that word apart, pre-scribed – pre-written – I tend to be an in-the-moment kind of person. And I want to respond to whatever energies are flowing around me. So I really think of ritual as a way of working with the energies that are happening in the moment. And what that might mean is stepping into an energy; or stepping out of an energy; or trying to shift an energy a little bit. And I think that the tools of ritual, including cards, because I do use them that way, are physical manifestations of energy. So it’s a way in the physical world to move things around that moves the corresponding energy. I really resonate with the concept of energy, and especially through things like Tarot. I think that’s an expression of energy. So I love building altars, and a lot of my rituals have to do with like physically moving these little tiny things around. And I mean, really, if anyone was watching me they’d probably just be baffled because I’m sliding things around and moving things around, until they feel right. And there’s this moment where things click in and it’s like the objects in the physical world have done what I want them to do with the energy. And it’s more of a feeling than an intellectual knowing. And that’s been really beautiful for me, just in my own process, because I am so over-educated. I was taught to use my brain from a very young age, and so finding a way to step into my intuition and step into my heart has been my work in this lifetime. And that’s the way I use ritual – to come back to myself; to get out of my head, get into my heart, find the feeling. And sometimes that’s like me needing to move my body around to move the energy; sometimes it’s moving little things on my altar; sometimes it’s outside – I often work with plant energies, so that can look any number of different ways. Sometimes I end up outside with a whole bunch of crystals and I’m just walking around the yard putting them with the plants that seem to want to hang out with them for a bit. Brigit: I think it’s quite a big shift for many people; because I know certainly in my teenage years I was exploring concepts of ritual – and even alongside Wicca and Witchcraft and all those fun things – and I always thought: I’ve got to follow this process, and I’ve got to do it like this and this. I’ve got to say these words. I don’t really know what they mean but I’ll say them anyway because they’re in the book. And, you know, it was still very much in my head. But the process that you’re describing is much more in the heart or in the body, or more in the intuitive flow of things, right? Brigit: And, in that sense, it doesn’t have to be like a sort of cookie-cutter model. It’s more an organic process that flows from you. And I think that’s probably where things can be really powerful – is when you’re actually really in the moment, and going with what feels right for you, in a ritual. Maia Toll: I think the reason it’s powerful is because you’re stepping into self-trust. You’re stepping out of someone else telling you how to pray – how to connect with the sacred – and you’re stepping into self-trust, and stepping into direct contact with the Divine – with energy of Divinity. And we’re told that we can’t do that. We’re told that we need someone to intervene for us. So it’s heavy stuff, I think, when you realise that you can step into direct relationship. And the Tarot is such an amazing gateway for that. Brigit: Yeah – because I’m definitely seeing parallels with the process around Tarot. So you can go from that very rational way of memorising the meanings, as you were saying, and learning the spreads, and following the rules, and all sorts of things; but, from my experience, it’s not until I really stepped into the fluid process and, as you say, the place of self-trust – that’s where the magic happens. Brigit: And that’s where you can go beyond a dependency on the cards. Or expecting that things will happen a certain way because you saw it in the cards. It’s a much different feeling and experience when you’re more in that place of self-trust. So, do you ever integrate Tarot with your rituals? Maia Toll: I really do use that like pulling a card at the end thing, often. It feels like a closing piece for me. So a lot of times, after I do whatever it is that I do – movements in the Universe or moving of stuff – I have a very Earthy side to me, so the need to have physical things that I touch and move. Plus, I love to create beautiful things, and beautiful altars allows me to re-engage with that energy, every time I walk by. So, often times at the end, I pull a card – like after I’ve done my process. It feels to me like it somehow integrates – energetically. And it allows my intellect to come back on board. Like I pull a card and I look at it, and I make all those mental associations like: Oh what does the colour green mean to me? And the woman has butterfly wings; what’s a butterfly totem mean for me? [00:15:40] So in some ways I think it allows me to hone my intellect back in, but in a way that’s very gentle and very in line with that intuitive space I was in. So I’m just realising this as I’m saying it – I kind of use the cards as the bridge between the intellect and the intuition. Brigit: And what about the other way around – how could we use ritual as part of our Tarot reading process? Because I think what you’ve described before is probably more like you do the ritual – a ritual – and then Tarot’s the integrating piece; but I wonder if Tarot was the primary function, or primary focus rather, how could we integrate ritual into that Tarot practice? Maia Toll: So I think, before we can talk about that directly, we have to talk about what ritual is. Maia Toll: What’s the difference between ritual and what you do when you go to Church or to Synagogue or to the Mosque? Is it the same thing? Is it different? And I’m not going to claim a Universal definition here, but I think for me, ceremony is something that we repeat over and over and over again. So, it’s the prayers as they’re written in the book. It’s a way of doing something where you walk through it the same way every time. Ritual, for me, is a bit more about being in the energetic flow. So when I think about how would I incorporate ritual, as opposed to ceremony, into the Tarot, what I’d say is, it’s about getting – that, for me, means that we’re talking about getting into your heart-space. What do you need to do to get into your heart-space, into your intuition, so that you can really connect with the cards and with whoever you’re reading for – because usually there’s someone on the other end, even if it’s you. And that’s going to be some in-the-moment decisions. But I think there are components that – it’s kind of like your bag of tricks. So I have some breathing exercise that I sometimes do. Sometimes it’s just really simple like: Breathe in for five counts, out for five counts. It doesn’t have to be complicated – something to still myself, get myself to centre. Lighting a candle and focussing on the flame. Using sage to clear your space – clear yourself – of any energies that you don’t want to muck up the reading. You can also use sounds. Sometimes you use a rattle to break up any stagnant energy. So what I love to do – I’m actually looking at my desk because it probably doesn’t look much like most people’s desk – I’m looking around for inspiration as I’m talking, because I have all these tools kind of laid out, ready to grab if I need them. And I think that that’s what I like to think about more than having the set: Every time I read I’m going to do this. I think that allowing yourself some flow, giving yourself some choices and some options, so that you can feel into the moment, and see what you need. Brigit: I really like that. Because that also forces you in some ways – in a loving way – to get back into your heart-space, as you said, and to be in that intuitive place, rather than just like…..
Maia Toll: And I don’t think that it actually pulls you into your heart-space, unless – there are people that very devout. They connect with those words on the page. Like those words speak to them, and they can connect in a way that I personally can’t. I don’t want to in any way denigrate how someone else might connect with pre-written words. It just doesn’t speak to me. It doesn’t work for me. And so what I find for myself is that when I try that route, there’s a total – like I’m all up in my head. It’s a total lack of connection. And it actually makes it harder for me to move into my heart-space. So having that ability to flow. Like if I want to read a Mary Oliver poem- if that’s what feels right, then that’s what I do. I think it’s the pause. You know what I mean? It’s just, instead of grabbing your cards, and slapping them down and doing a reading, the ritual is stopping and pausing – and acknowledging that you’re about to step into a kind of interstitial space – that in-between space – where you’re connected in a different way. And there’s no real connection when I’m doing it that way. But when you do just make that little bit of extra time to pause, and centre, and ground, and so on; that can make such a difference with the reading and the significance it will have. Even if it is just another two-minute reading – just taking some breathes or shaking the rattle. I love that idea. I need a rattle. But you know that’s what will help us have much better readings, I believe. Maia Toll: I think you’re absolutely right. And I just – there is just such deep wisdom in that. I think what she’s really saying is: It’s not just what we do, it’s how we do it. And that’s what we’re talking about, right? We’re talking about how you’re going to approach this reading – pulling out the cards – creating that sacred space. And sometimes we need physical reminders of sacred space. We need to walk a circle, or lay out crystals at the four corners. But, that’s the mind that needs that. Your heart can create sacred space simply by tuning in and willing it to be there. Brigit: Yeah – I can really feel that, and I think that’s very important. Maia, what about using Tarot to help us connect with the different sort of natural cycles seasons. I guess I’m thinking of seasons, moon phases, even just our own personal cycles – for women, say a menstrual cycle. How could we use Tarot to honour those different cycles? Maia Toll: That’s a great question. I’m thinking of an exercise that I do with my Witch campers that is really lovely, and I think that it could be kind of modified and work with cards. So here’s the original exercise. The original exercise is that we have a bowl, and we have a little pile of stones. And on the new moon the bowl is empty, and then you add a stone every day up until the full moon. And then you take a stone out every day until the new moon. So it’s just, again, we’re working with giving ourselves some physical cues, and something to interact with, that helps us to stay in tune with the cycles. So I’m thinking with the cards, the Major Arcana – you were saying this earlier, Brigit – that they tell a story. They’re a transformational story. So I think that something similar could be done with the cards where you start at the new moon, and you lay out the cards in order – one each day – maybe just doing a short reflection, or meditation, on that card. Because we’re working through the transformation of the season. Here’s the other thing I love. I love repetition, because every time you go a little bit deeper, a little bit deeper, a little bit deeper. So the lovely thing about working with the cards in the same way over and over again, is you are going to see them differently every time. And I kind of love – I’m thinking of the menstrual cycle that you’re bringing up – wow! Wouldn’t it be great to just really start to understand our cycles, and how we feel within our cycles, and match that to a card? So you have that to come back to over and over again; because let’s face it, there’s a day in every menstrual cycle that is the Tower. Maia Toll: So you know it’s coming: Oh, okay, there’s the Tower. I think it would be actually really reassuring. Brigit: Yeah – I like it. Would it be – sorry I’m getting into technical details because that’s how my brain thinks – but would it be like a conscious selection of the card for the day? Or would it be like a random selection – unconscious? Maia Toll: What I was thinking was that you could kind of match the cards. You could even – you could start as a little bit of an intellectual exercise where you think about: How do I feel on this first day of my menstrual cycle? And you choose the card that matches; but then the next month you have that – you already chose it. So you have your cycle laid out first. You can keep going back and going through it. And I think you could do the same thing – new moon to full moon, full moon to new moon – after you work out the pattern, then you go through the pattern over and over again. But my experience is when you can step beyond that – because that’s really linear thinking, right? We do it once and we’re done – and that’s not the way Mother Nature works. So I think that we sometimes don’t allow ourselves to deepen our experience, and mature our experience, because we’re so focussed on the one -and-done– getting onto the next thing. So I love this idea of how can we use the cards cyclically, and then re-visit, and re-visit, and re-visit; because each re-visit is new. You’re not the same. Brigit: Yeah – actually now I’m seeing something. Okay, so let’s say if you’re working either a menstrual cycle or the new moon cycle, it doesn’t really matter – you could almost lay out each card into a circle so that circle is complete when the cycle is complete. But the thing that might change is there would be a card in the centre and that would represent you. And maybe for each new cycle that card is either consciously or unconsciously selected. And then that may relate to each of those cards in that bigger circle. Maia Toll: I love that. Because then every day you’re looking at how these two cards relate to each other – the day card is relating to the you card, right? So you’re looking at that relationship. Brigit: We create magic together – I love it. Maia: What I – I’m getting physical now and I want those cards to be a little smaller than the normal cards, because I want to be able to lay them out in a circle on the table and not take up the entire kitchen table. I want to be able to do it on a side table, and make that work. So is there anything else that we haven’t covered about ritual and how Tarot can sort of integrate with ritual, and vice versa, that you want to share? Maia: There’s so much we haven’t covered. Maia: We can keep creating rituals until – we could re-do this next month, and the month after. I think, for me, more than anything else, what I want to do is give everyone listening permission to create. Find your inner creator, because there’s a spark of Divinity in that. And when you can connect with that, then you’re going to come fully into your heart. And that’s going to help you to do that reading that really connects for you and for the person that you’re reading for. So, you know, don’t start listening to this and run to your computer and look up Five Best Rituals for doing Tarot. Allow yourself to feel into it. Give yourself that gift and that freedom. And it might feel really strange at first if you’ve never done that before. It might feel like you’re breaking the rules, or you don’t know what you’re doing – like you’re not doing it good enough. And just see if you can allow yourself to move beyond that. Pull a card. See what the cards want to tell you about moving beyond that. Because I think that it’s really – it’s a deeper level of work when you allow yourself to create rituals for yourself. Brigit: Wonderful – that’s very good advice. Very good. Maia: You are so welcome. Brigit: So tell me, where can people out more about you? Maia: You can head to my website, which is: www.maiatoll.com – and if you spell it wrong you’ll probably still get there anyway. Brigit: Beautiful – and it’s looking amazing. You’ve done such a good job on it. Brigit: Thank you again Maia, I really appreciate it. And I think you’ve probably shifted the mind-sets of many people around what ritual is, and that it’s okay to make up your own thing. You’re not doing it wrong. In fact, you’re doing it all right when you’re in that more sort of organic, free-flow of rituals. It is really my joy to help people find that space of self-trust, because I think that’s really what it is. That’s the bottom line – you’re stepping into trusting yourself. Maia: And this was a gift, Brigit. Brigit: Likewise – share the love. Well thank you, and connect soon. Maia: We’ll connect soon. Have a great day. If you loved this episode about Tarot and ritual, you are going to love the Biddy Tarot Community. Imagine a place where you can step into your fullest potential as a Tarot reader, and connect with other like-minded individuals who share your love for Tarot. We talk about everything under the sun with Tarot, from ritual to how do you do a reading, to how do you interpret different cards, and so on. The community is filled with the discussion forums; the Tarot101 course to help you learn Tarot; and monthly live webinars with me; plus, many, many more benefits. And just remember: Your tribe is waiting for you. Thank you so much for listening, and I can’t wait to connect with you again next time.